The Dualstream 3 is the latest development in wet gas measurement for the upstream oil and gas market. Solartron ISA engineers have taken 25 years of experience and knowledge in wet gas flow behavior and added water fraction measurement to the Dualstream family of meters. 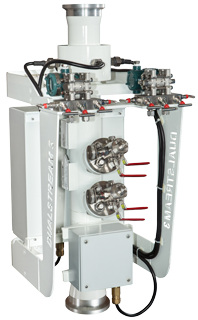 Dualstream meters have been successfully used around the world in over 300 gas fields for solutions in hydrocarbon allocation and reservoir optimization. The water fraction measurement utilizes a new unique approach developed especially for wet gas applications. Using multi-path sensors, the water fraction meter can obtain an extremely accurate record of the liquid phase fractions for virtually any flow regime. There are no probes or dead volume traps to worry about. The measurement sensor is the only non-intrusive sensor available that can detect the water fraction across the entire pipe diameter for wet gas flow. The water fraction measurement coupled with Dualstream Venturi offers the simplest, reliable method for wet gas. This makes it ideal for harsh or remote locations. There are no regulative concerns as with sensors with radioactive sources. Whether needed for allocation, reservoir optimization or detecting water breakthrough, the Dualstream 3 is the new standard for a reliable solution to everyday problems in wet gas measurement.